The first spears of asparagus have arrived at the Capital Region Farmers Market!!! I have been waiting not so patiently for their arrival for weeks. It turns out they arrived two weeks earlier than last year. When I know it’s spring, I just think… asparagus. But I must be more patient and give the shoots a chance to develop into fully fledged spears. For me, asparagus is one of the hallmark ‘buy local’ vegetables. Many Australians love it as much as I do, which has encouraged the supermarkets to ship it in from the other side of the world in the off season. This is not good. It means a drastic increase to your carbon footprint. Besides, we love what we can’t have. Since deciding to only buy locally grown asparagus, I appreciate it so much more when I can have it. Choose asparagus that is plum and firm. You don’t want lank and wrinkly spears. Sometimes the tips can get a bit slimy too, you don’t want that. I used to choose stalks that were thinner thinking they were superior to the thicker spears. But this isn’t true. It won’t matter how thick the spears are on good asparagus. Likewise, there shouldn’t be a need to ‘peel’ asparagus spears. When you want to cook the asparagus, hold each end of the spear, then bend it till it snaps. It should naturally snap at the point where the base of the spear becomes woody. Sometimes I’ll have a munch on the top of that woody end, because I love asparagus that much. But what’s left of the spear should be crisp and enjoyable, not woody or stringy. This trick works best with the freshest asparagus. What do you like to do with asparagus? 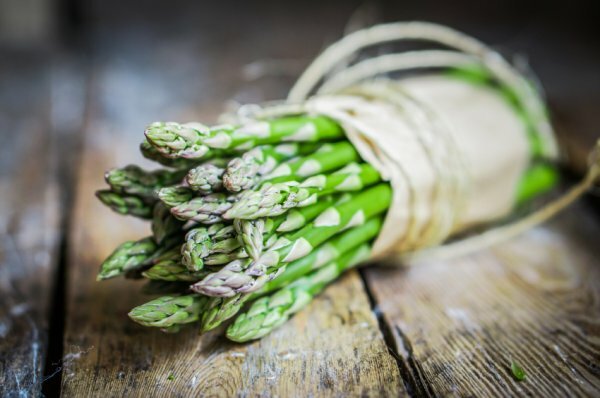 As a child there were only two ways we’d eat asparagus: blanched and served with melted butter, or blanched and served with hollandaise sauce. Both are divine. I am much more creative now though. Asparagus is great chargrilled, or on the barbeque with some thick juicy steaks. During the week I pan fried a beautiful piece of lamb backstrap. I added a few spears of asparagus to the pan, cut at an angle, to cook in the pan juices and served them up as a lovely spring dinner. Asparagus is delicious dunked into soft boiled eggs, perhaps with some toast soldiers too. My most impressive asparagus dish was a salad with smoked trout, potato and balls of goat cheese rolled in dill. It was delicious and very pretty. i’m with proust on this one… apparently, about a third of people detect no effect. Weirdly, my children who normally turn their noses up at vegetables, have been scoffing their asparagus and asking for more this week. Monday we had pan fried salmon with pan fried asparagus (just for a minute at the end). Tuesday we had BBQ chicken with BBQ’d asparagus (just for a minute at the end). I don’t know about this business of snapping them or cutting the end off – just cook it and let the eater decide how far down the stem s/he wants to eat. As for the urine thing – this is a major selling point if you’re trying to get boys to eat asparagus – promise them something gross will happen and they’ll be right into it. Henry, that was Solid Gold! I love asparagus, especially the low prices available now. It goes with almost anything (even my favourite takeaway, the Chiko roll). Judging from the neglible comment on this thread one would think that all our readers live on is coffee and kebabs (peasants!). The one problem is the after smell, in urine. I think if food scientists could remove the thing in asparagus that creates this problem then farmers would sell a lot more.